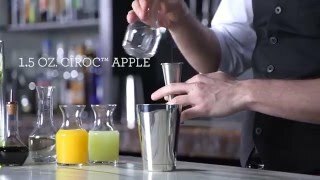 Add the lemon juice, creme de cassis and calvados into a cocktail shaker with ice. Shake well and strain into an ice filled highball glass Top up with the orange juice. Garnish with a slide of apple and dribblle a litte creme de cassis on top top to get the 2-tone look.